As President of the Alliance for Excellent Education and former Governor of West Virginia, Bob Wise is a leading national advocate for the use of technology and digital learning to effectively strengthen the student learning experience. Governor Wise will share the Alliance's vision and mission focused on how technology can enable deeper learning and the imperative of a national effort to invest in broadband technology to achieve whole-school reform. The Alliance for Excellent Education is a Washington, DC-based national policy and advocacy organization that works to improve national and federal policy so that all students can achieve at high academic levels and graduate from high school ready for success in college, work, and citizenship in the twenty-first century. 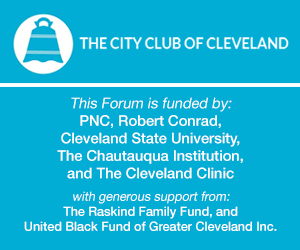 OneCommunity, in partnership with The City Club of Cleveland, has developed the Broadband: Understanding the Fiber of our Region speaker series to foster thoughtful discussion on how we can come together to best position Northeast Ohio to be a national leader in the innovative use of broadband and technology to drive our economy, our governments, our schools and the success of our citizens. To continue the dialog after each City Club forum, a panel of regional experts will participate in an open, online forum hosted by the Civic Commons. Visit http://theciviccommons.com/knowbroadband to participate.